Fig. : Presentation of the national reward "Mobilität 2017" (bmvit, 27.01.2017) by the Federal Minister for the research project "H2 Mobility" . Over 70 participants from 13 countries (Austria, China, Denmark, Germany, Italy, Israel, Japan, Finland, France, Slovenia, South Africa, Sweden, and USA) attended the exciting workshop “Highlights of International Fuel Cell Research 2017” on May 15, 2017. 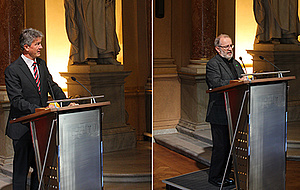 Prof. Harald Kainz, Rector of Graz University of Technology, opened the workshop and welcomed the renowned scientists. 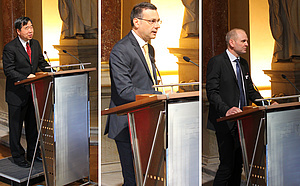 Theodor Zillner, representative of the Austrian Ministry for Transport, Innovation and Technology (bmvit), pointed out the importance of the international network IEA and the international cooperation in science and technology. D.J. Liu, Argonne National Laboratory USA and Operating Agent of Annex 31 and Fabio Matera, Consiglio Nazionale delle Ricerche Italy and Operating Agent of Annex 35, introduced the IEA Technology Collaboration Programme and the Annexes. Prof. Viktor Hacker, Institute of Chemical Engineering and Environmental Technologies of TU Graz and local organiser of the workshop, gave a short overview of research groups in the field of fuel cells in Austria. In the main session, the experts presented and discussed in 15 lectures the results and scientific breakthroughs of international fuel cell development. In the evening, the poster session gave the opportunity for discussion with the experts and national representatives of the annexes. Application areas for fuel cells include mobile and automotive applications, decentralised power generation and portable devices. The research and development at the Institute of Chemical Engineering and Environmental Technology is focusing on the improvement of the performance and durability of fuel cells. Fuel cells are characterised under realistic operating conditions and under conditions for accelerated ageing (Accelerated Stressing Test; AST). In-situ analysis of failure modes of polymer electrolyte membrane fuel cells (PEM-FCs) is carried out using polarisation curves, cyclic voltammetry, electrochemical impedance spectroscopy, hydrogen diffusion measurement, gas analysis and the quantification of fluoride ions. Reference electrodes are used to measure cell potential distribution, current density distribution is measured using segmented cells. Also extreme conditions such as hydrogen starvation and cold-start at -20°C are investigated. Low temperature fuel cells utilise predominantly hydrogen to produce heat a nd power. Commercial processes for hydrogen production and purification are technologically mature for large scale applications such as refineries but not feasible for small decentralised applications. Therefore new and innovative technologies are developed in order to fulfil the requirements of these novel energy systems. 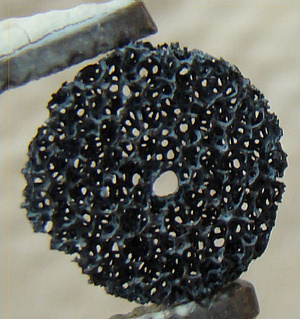 Research is focusing on the demonstration of the reformer sponge iron cycle (RESC), which is currently operated as a fixed bed reactor for reforming gaseous and liquid hydrocarbons to hydrogen in the laboratory. The R&D efforts focus on the development of innovative electrolytes and membranes for low temperature fuel cells. The work includes the synthesis of new catalysts for alkaline fuel cells and the optimisation of platinum catalysts for acidic fuel cells. A method for the processing of carbon nanofibers (CNFs) as catalyst carrier was developed. 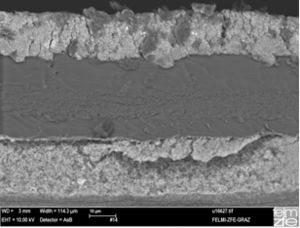 Fibrous carbon has a significantly smaller surface area than carbon black but extraordinary mechanical and physical properties as well as a higher resistance towards chemical and electrochemical corrosion.